When I first saw Sumitomo tires in ads, I thought they were some no-name brand -- with good reason, as their tires are priced rather affordably. After doing some research, I was stunned. You may be surprised to hear that Sumitomo is one of the largest tire manufacturers in the world! They either manufacture or have joint stakes in well known brands such as Dunlop, Goodyear, and Falken. They also own subsidiaries like Doral and Sumic, which features the very affordable GT-A All-Season tire with great reviews and pricing on Amazon. Sumitomo manufactures their own brand of car tires under the "HTR" model line, as well as SUV/light truck tires (HTR Sport). Read onward to get our take on their tires. The HTR A/S P02 in the W-speed rated sizes rank above the median of this category, with the best tire being the BFGoodrich g-Force COMP-2 A/S. The P02 is a very affordable ultra high performance all-season tire, with a 4-year/45k mile warranty (W-speed rating). It scores very similar to the Kumho Ecsta 4X II, which beat out the HTR A/S P02 in Tire Rack's test for both dry and wet traction. However, if you anticipate driving in snow and ice and can't or don't want to mount a separate set of winter tires, the HTR A/S P02 does fairly well. You should also consider the Continental ExtremeContact DWS 06, which has the best snow and ice traction ratings in the category. 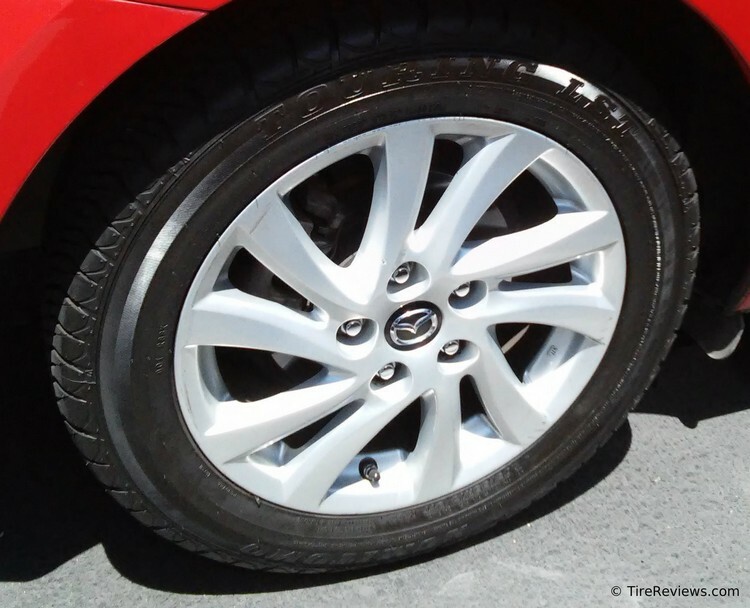 Pictured below is the Sumitomo Touring LS T tire on a Mazda3.